It was certainly nice to be quoted and published in such an accomplished book like Lean UX, although I don’t actually know who the author, Jeff Gothelf is, or how he learned of my startup’s MVP. My best guess is that he took notes during my presentation at the Lean Startup Meetup in Jan 2012 in NYC. 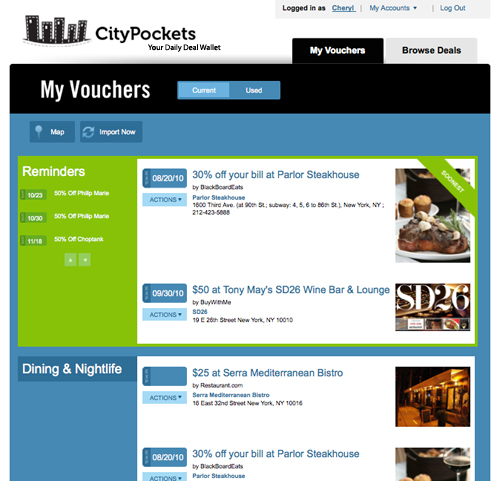 For the most part, the facts he represented were accurate, except that I didn’t assign an email address to each user, but instead got them to email their vouchers to coupons@citypockets.com (ala plans@tripit.com). Alas, here are some of our early product iterations and the thought process that went behind it. 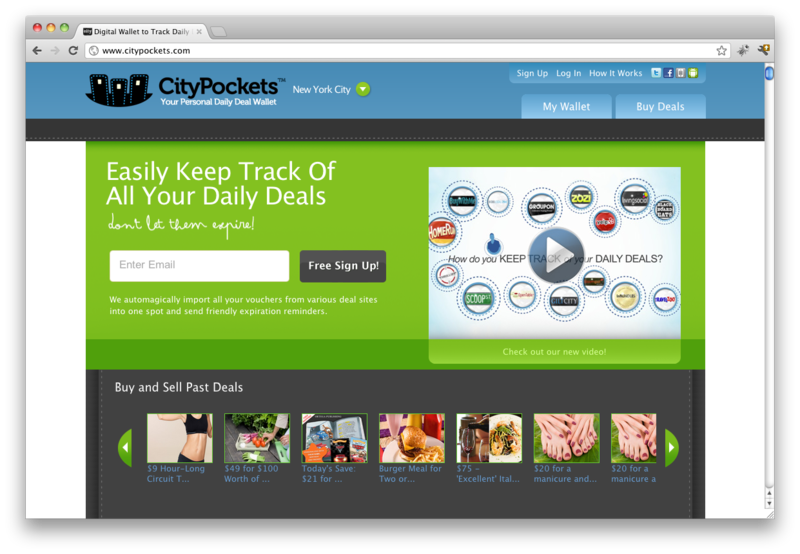 CityPockets: For those who aren’t familiar, back in 2010, CityPockets.com was the first “digital wallet” for daily deals. The idea is that users would sync their Groupon, Living Social, Gilt City, etc accounts with us so we can keep track of all their vouchers’ expiration dates, so people never forget to redeem them. We also provided a secondary marketplace for people to resell vouchers when they could no longer use them. Finally, we used our users’ purchase history to make predictions for future voucher buying behavior. 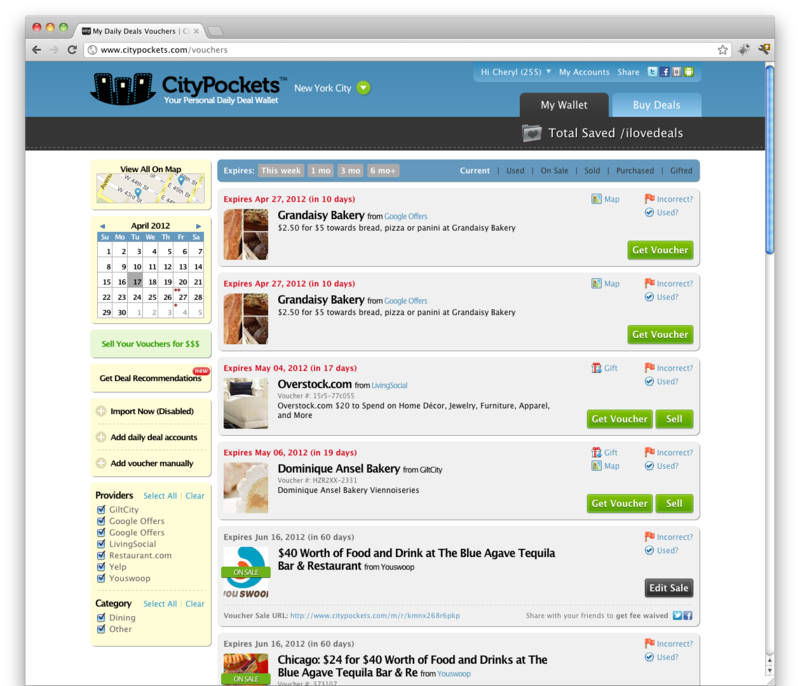 Homepage for CityPockets.com 1.0 – I was in love with the “organic” look and feel and it was clearly reflected here. 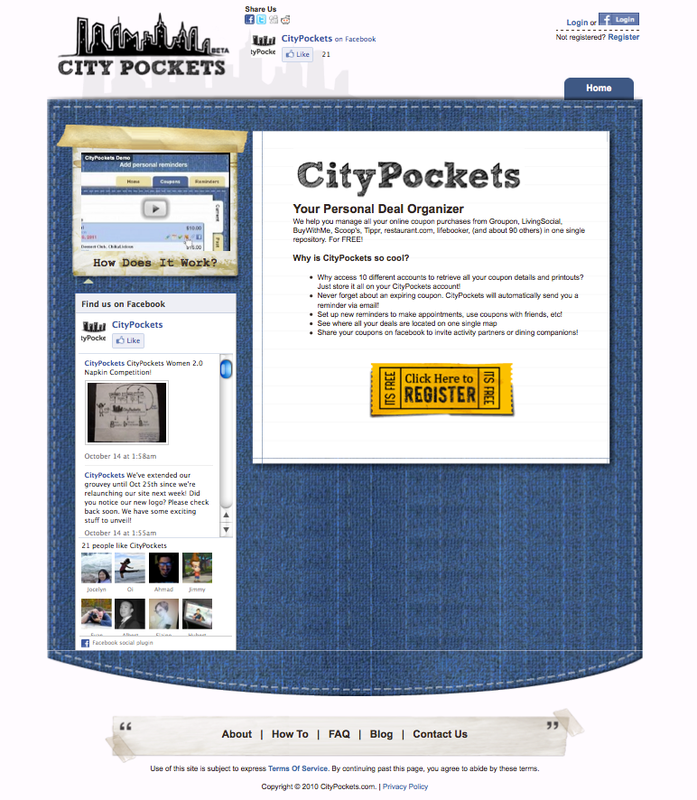 I’m almost embarrassed to reveal the very first look and feel of CityPockets.com back in June 2010 when we first launched it to 50 friends and family members. We started out by bootstrapping the idea in Feb 2010; it only cost us $800 to outsource the visual design to a Pakistani agency via elance while my co-founder coded the backend. We wanted to test whether people thought the problem of managing the expiration of daily deal vouchers painful enough that they’d do the work to “submit” or email vouchers to us. Rather than build a scraping tool (which was tedious and took time), we decided to do it manually until we hit a certain metric (in the book, Jeff said ~500 emails/day but it was actually ~500 vouchers/week). A ton of people ended up emailing us dozens of vouchers in a zip folder and some even forwarded their Groupon and Living Social confirmation emails. We grew from 50 F&F users to a modest 300 users in a month via word of mouth. It was pretty funny because behind the scenes, every time someone submitted an email to the system, I’d get an alert on my phone. Then I’d immediately get busy copying and pasting each voucher by hand (a tiring and mindless ordeal). Our website’s original SLA (service level agreement) in our Terms of Services for “voucher upload time” was something like 24 hours. Hey, I still had a full time corporate job at the time and need 6 hours of sleep! If our users were tech savvy, they’d know right away that our system wasn’t automated, given such a long lag time. Anyway, upon hitting our agreed upon metric, we decided it was time to outsource the manual copying & pasting to someone in India via elance for ~$0.10 per page. Oh boy, was that was a relief to me. In the meantime, Jhony and I had also set up another internal benchmark for when we’d both quit our corporate jobs to work on this full time. We decided that we would quit when we got to 1,000 users or when we got our first investment, whichever happens first. We ended up getting our first investment from an accelerator, LaunchBox Digital, and spent 4 months in Durham, North Carolina from Aug – Dec 2010. While at LaunchBox, we decided upon another arbitrary metric to hit (eg. $x/week spent on elance) before Jhony would finally build the automated bot and scraper system. We hit that metric in September 2010. 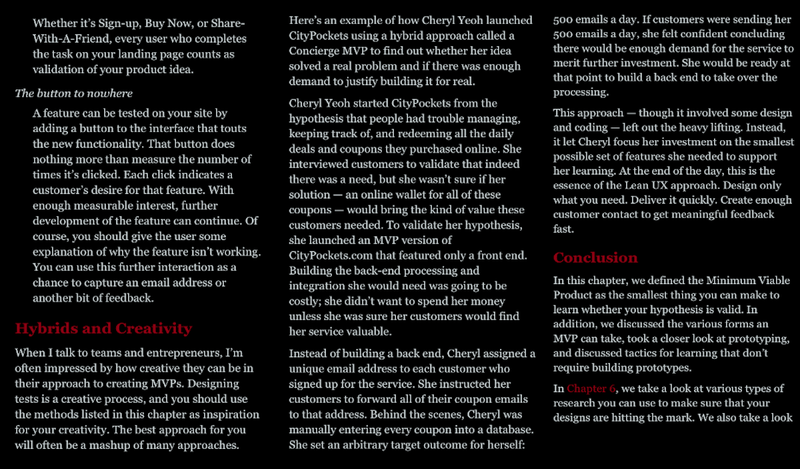 Our revised homepage for CityPockets.com 2.0 with Viget’s 10 hours of design help. We simplified the logo and gave the site a more professional look & feel. 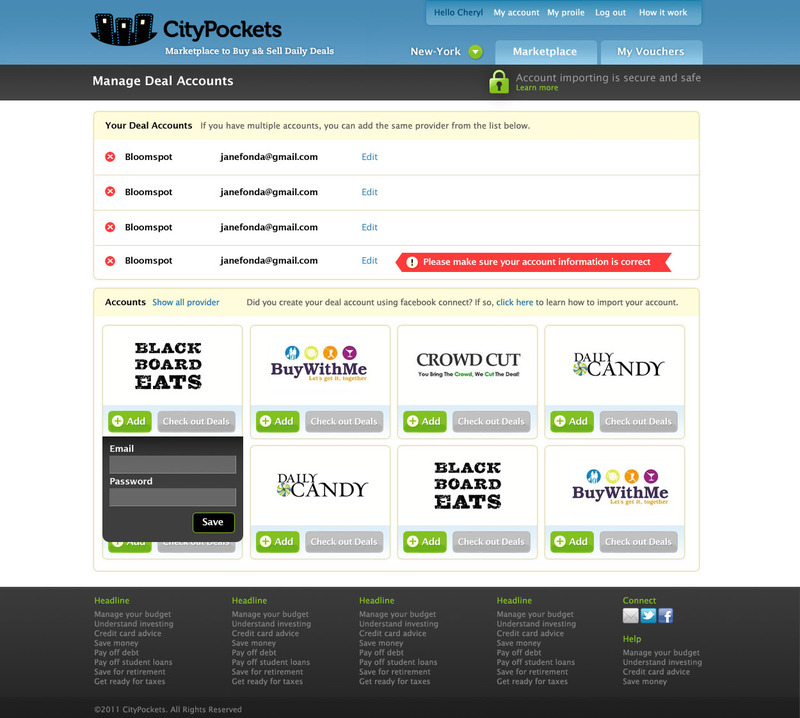 The logged-in landing page for CityPockets 2.0. Notice the new “Import Now” feature – we now supported voucher syncing. Our users no longer had to submit their vouchers via email. Finally, we launched the single sign-on feature on our website with a major redesign. We had 10 hours of professional design help from Viget, who did some complimentary work for our accelerator, Launch Box Digital. Through the redesign, we learned the importance of simplifying our logo (note the coupon-smiley-face-city nuance?) and creating a professional brand presence, especially when we were requesting multiple account password info from our users. It was a relatively flat and clean design, which we were very happy about. Creating the single sign-on functionality was probably the best decision we ever made – user acquisition and engagement shot up and we started growing by leaps and bounds when people heard of this much-needed service that was so easy to use. The only catch is that it was an auto-sync yet so users still had to click on the “Import Now” button to initiate the pull, a technical decision made to reduce the number of calls made to the sites we were scrapping. Anyway, between Nov 2010 – Feb of 2011, we unfortunately got side-tracked by a side project to build a merchant loyalty system as we were negotiating a potential acquisition by Living Social. We didn’t refocus our attention to CityPockets until March of 2011. 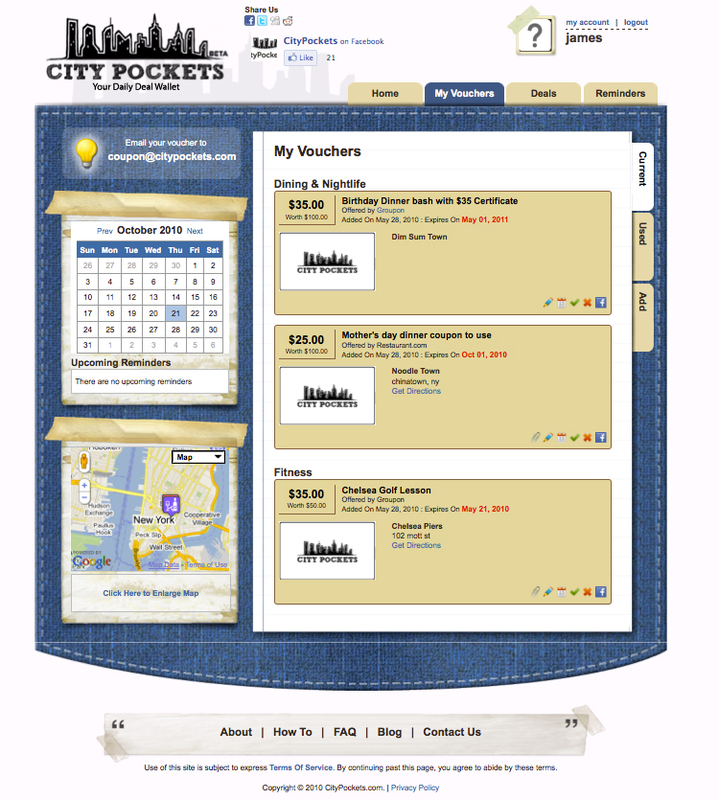 The final CityPockets 3.0 version. Logo and sign up process were simplified even further. Updated our intro video. Added secondary marketplace and launch our mobile apps. 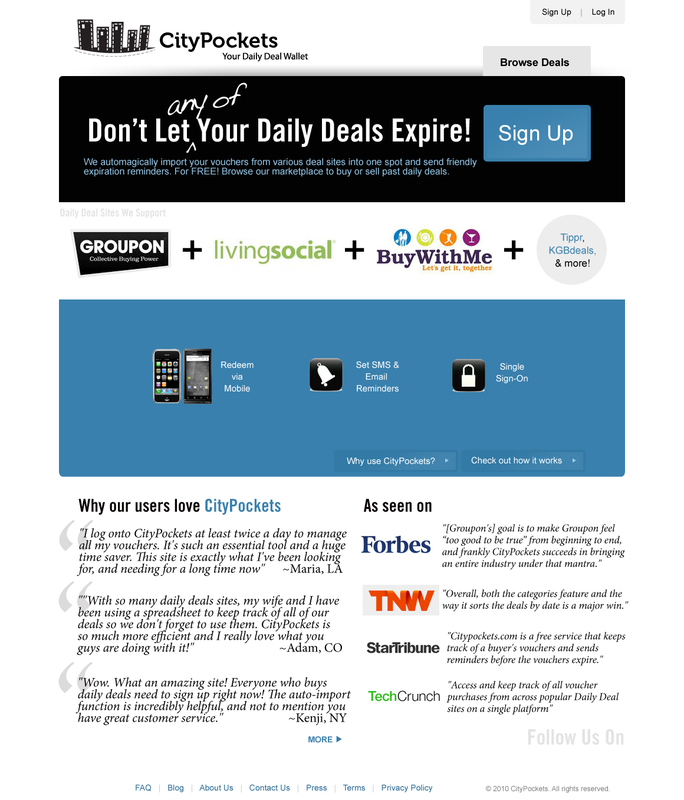 Logged-on landing page of CityPockets 3.0. By this time, we had the auto-syncing functionality (no need to “Import Now” button). We also tested deal recommendations. My Account page. Here you can see our account linking / syncing process. We added a “lock” symbol to convey that this page is super secure and safe. In May 2012, we raised our seed round and decided to update our design once again, adding support for up to 60 different daily deal sites at the time, including the much requested for Google Offers (which was technically pretty difficult to do). We had also launched our secondary marketplace for easy voucher resale as well as our iPhone & Android apps. This time, we decided to contract a designer from Canada via a referral from a YC company. Our designer told us that a logo should always be something that people can recall from memory and easily draw it out. So we simplified the logo further to 3 coupon-buildings and made stickers that fit right over the apple logo on our MacBooks (the light shines through the coupon-city windows). We stuck to our blue-green color palette but replaced black with dark grey so it didn’t look as ominous. Finally, we added an intro video to our homepage, which increased sign-up conversions by around 30%. Hopefully you found our MVPs and design iterations somewhat interesting or useful. Please feel free to ask me any questions about my thought process at the time. Thanks Saj for reviewing a draft of this post. Although I haven’t read the Lean UX book, seems like it has great material and solid examples. Here’s the Amazon link to buy it.